The shoe is the original wearable. It's the one that has allowed humans to walk on tougher terrain thousands of years ago, helped the Romans conquer Europe and allow elite athletes to run hundreds of miles without turning their feet into bloodied stumps. Pretty much everyone has at least one pair, so it's a no brainer that the shoe will be next accessory to go smart. So why is the shoe such a big deal? When we spoke to custom insoles manufacturers Wiivv, they had a pretty good idea why. "There's all these different theories about the foot from ancient Asian medicine to more modern theories," explained Wiivv co founder Shamil Hargovan. "Also, bear in mind just how many joints and bones are placed in the feet. Your entire movement begins with the feet and striking the heel and the way the arch hits the ground over time. The ability to collect things like gait, you just can't do that anywhere else." It was a similar story when we spoke to Hyungjin Cho, CEO of Salted Venture and creator of the Iofit smart balance connected shoes. "In the foot there are so many possibilities," Cho tells us. "All wearable devices rely on the wrist, but the most valuable information comes from the foot." So who are the companies making the greatest strides in making the shoe smarter and where will it impact on our lives? We take a closer look. Runners have been benefiting from connected shoes for some time now. The Nike+ shoe sensor launched way back in 2006 and Adidas followed later with its Speed Cell foot pod sensor. Fast forward to 2016 and those sensors are little more difficult to spot, but still give you all those useful metrics. Leading the charge is Under Armour with its SpeedForm Gemini 2 Record running shoes. Yes, it's a mouthful of a name to say, but these normal looking pair of trainers include an embedded sensor that can monitor things like distance and pace. It enables you to run without a phone, letting you store a handful of runs on the shoes themselves, which can then be synced to the Under Armour Record smartphone app. It even starts automatically tracking so there's no set up or need to wait for a GPS lock. Just slip them on and hit the roads. They won't last forever of course so if you don't want to invest in a new pair of running shoes, there's always the smart insole option. 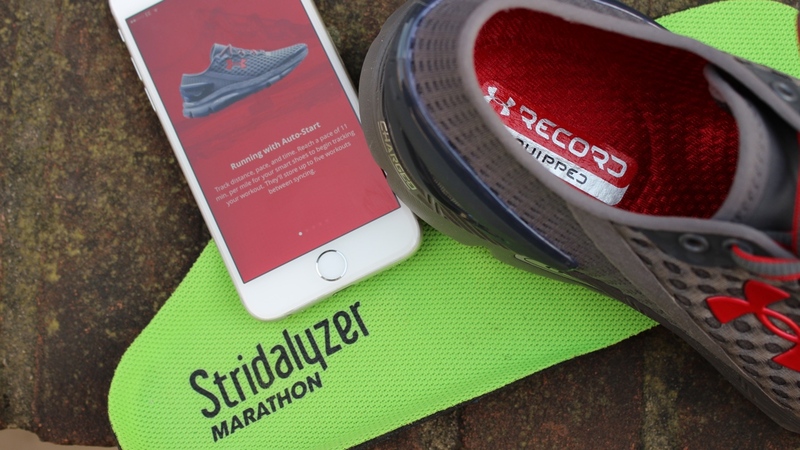 There's a few options out there, but the Stridalyser insoles goes beyond the usual run tracking and could actually help prevent long term injury. Once you've swapped them for your dumb insoles, they can give you real time pressure analysis to show you whether you are putting too much strain on your knees or in the wrong areas of the foot. The first smart shoe concept Lenovo dreamt up packed a screen that could display your mood and your heartbeat. Now with its second gen pair it's veering massively on the whacky side again with the kicks that also work as a mobile game controller. Powered by Intel's Curie wearable chip and made in collaboration with Vibram, the smart shoes can be integrated and paired with mobile games swapping the on screen controls for your feet. So you can actually run in an endless runner game or dance in a dancing game. It could be a good fit for VR and AR games as well. The prototype also promises to deliver fitness tracking in the same way that Under Armour's running shoes can along with a 3D scanner built into the customizable insole that can track elements such as sweat and body fat percentage. But that's not all. There's a trail of lights on the sides of the shoes to aid visibility in those nighttime runs and apparently syncs with the music you're listening to. When will we see it? It could land in 2016, but there's no firm release date just yet. There's definitely some interesting ideas here though and is definitely a unique take on smartening up the shoe. Don't worry non-runners, there's more to connected footwear than clocking up miles sans smartphone. Samsung spin-off startup Salted Venture already has working models of its Iofit smart balance shoes. There are fitness and golf options, but it's the latter that could really make most of the tech on board. Instead of focusing on metrics like distance and speed, the Iofit shoes pack a series of pressure sensors inside the outsole that monitor the amount of force you place on different areas of the foot in real time. For golf, stance and positioning are vitally important, so the Iofit shoes take that information and send it to the companion app for further analysis. There you can breakdown strengths and weaknesses in your form using video analysis to compare to previous swings or a professional golfer's technique. It's currently the only kind of smart shoe out there built for golf, and Salted Venture has told us that it could look at using the tech for other sports like skiing and cricket. It even has plans to add sensors to monitor energy and posture from the feet. Yes, you will soon be able to own a pair of shoes that can keep your feet toasty. French startup Digitisole started with heated insoles and has now gone the full works building its heated tech into a smart shoe. Set to be available in three designs, the most eye-grabbing pair look like they've stepped out of a Back to the Future movie and has a self-lacing inspired feature automatically tightening around the ankle to keep them snug and secure. Using a heat pad and rechargeable battery inside the shoe, the heat pad transforms energy from the battery into heat to generate the warmth. The temperature is controlled from the Digitsole app on your smartphone, while a built-in thermostat should ensure it's doesn't get too hot in there. There's two more normal looking pairs in the range that will additionally track distance, step counts and calories burned. The app will even give you a 'fresh' reading so you know when you need to change up those insoles. But it's not just about fitness. There are companies using the feet to provide more life-saving benefits. Orpyx is one company that's focused on building insoles that slip into your shoes and work alongside a shoe pod to transmit data to an accompanying smartwatch. The setup recognises when you're putting pressure in the wrong places of the foot and is designed to help prevent foot ulcers or amputations due to sensory loss. British-based bioengineering company HCi Viocare is also working on something similar using an array of embedded sensors that work inside either a standalone insole or shoe. The user is then able to measure varying levels of pressure a bit like the Iofit shoes can. It can also deliver data that can determine when you're in a hot and humid environment. Data is sent to a smartphone in real time and alerting users to dangerous times and areas of pressure with the ultimate hope that it could help prevent diabetic foot ulcers.